Office designers have been creating beautiful wide open work environments over the last few years and the trend has caught on. Open plan spaces are designed to promote team collaboration and creativity. However, when cubicle walls are lowered down, everyone can see everyone else working and they can hear everything going on as well. Consequently, some workers are now struggling to concentrate and are competing to hear and be heard. If you are old enough to remember the TV series Get Smart, then you may recall the “Cone of Silence”.Â That’s the big clear bubble that came down overhead to block everything out for private conversations. See “Cone of Silence” inÂ the more recent movie!Â If reducing ambient noise sounds like a good idea for your office, please keep reading. Plantronics Focus B825 wireless offers sanity from noise pollution in open areas. Voices and sounds bounce off every hard surface like PC monitors, metal surfaces, walls, windows, and ceilings. Contact centers are only one example of where this is happening. Some enterprise offices have â€œbench seatingâ€ which literally looks like temporary workstations on big long tables and you can see as far as a city block across the room. Another example is a â€œhotelingâ€ environment where visiting team members from other locations can temporarily park at an open type cubby desk to jump on conference calls or send email.Â Room acoustics in open areas can be lousy. 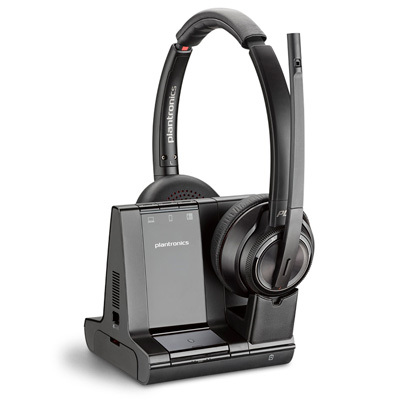 Plantronics has responded with a UC wireless binaural headset solution to help manage workplace noise distractions. BTP first mentioned this new binaural headset in ourÂ June 9th blog. The new Voyager Focus UC B825 wireless headset helps people stay productive and helps guard against unwanted sounds getting transmitted to callers. Since PC sound is increasingly being used for calls as well as multimedia, whether it be listening to webinars or video training, the new Voyager Focus UC connects to your PC via wireless USB adapter. Users are free to roam while at the same time can be confident the microphone is not leaking every bit of ambient noise to the caller. Some cool features include the OpenMic button which allows you to hear your surroundings when you need to. The headset automatically goes on mute when the headset is taken off; it unmutes when you put back on. You get up to 12 hours talk time. It has precision tuned triple-mics with enhanced DSP for superior background noise canceling on calls. The microphone is the same as Voyager Legend, which is great at eliminating road noise when traveling. The leatherette ear cushions are cushy and help seal out surrounding noises, such as loud speakingÂ neighbors. Voyager Focus UC is Class 1 Bluetooth (up to 150 feet) and is compatible with all major UC platforms. Voyager Focus UC B825 is also available in a Microsoft Skype for Business and Lync version (B825-M). Both UC and Microsoft versions are expected to ship early August 2015. Business Telecom Products is accepting customer orders now for earliest delivery. To order or learn more about this ground breakingÂ new headset, click here to view Voyager Focus B825 on our web site.Â You will see pictures, productÂ details, manufacturer’s data sheet and user guide pdfs. For a good laugh, check out Get Smart’s “Portable Cone of Silence”.